Abstrak: Penelitian ini bertujuan untuk mengungkapkan penggunaan strategi pembelajaran dalam upaya meningkatkan kemampuan para mahasiswa dalam menguasai kosakata Bahasa Inggris di IAIN Sunan Ampel Surabaya. Penelitian ini adalah penelitian tindakan kelas, yang melibatkan empat fase yaitu perencanaan, penerapan, pengamatan, dan refleksi yang dilaksanakan di setiap siklus. Analisis dalam penelitian ini dideskripsikan secara apa adanya dan dilaporkan sesuai dengan prosedur penelitian tindakan kelas baik secara kualitatif dan kuantitatif. Sedangkan hasil temuan dalam penelitian ini dijabarkan berdasarkan interpretasi peneliti. Berdasarkan hasil tes yang diberikan di akhir setiap siklus, ditemukan adanya peningkatan yang cukup besar dalam penguasaan kosakata mahasiswa setelah mereka menerapkan strategi pembelajaran ini. Hal ini bisa dilihat dari besarnya persentase dari siklus ke-dua yaitu sebesar 87% dan pada siklus ke-lima mencapai 98%. Yang akhirnya bisa disimpulkan bahwa strategi belajar kosakata memfasilitasi mahasiswa dalam penguasaan kosakata. In the area of English language teaching, the contribution of learning strategies to successful learning is great as proved by the research done by O’Malley and Chamot in 1989 which stated that giving strategies training to learners, the results were very positive. In the research the learners were grouped into three consisting of eight to ten students in each group. The first group finished the task without strategy training. The second group received strategy training of how to use cognitive and social strategies. This training entailed analyzing the structure of an oral report and practicing their presentation with peers who provided feedback on aspects of the report. The third group received only social strategy training in the form of co-operation with the peers. The result was that the speaking skill of both groups using the strategy training was highly improved. Knowing the empirical research that vocabulary learning strategies greatly affect vocabulary mastery, the efforts to popularize learning strategies into the classroom activities has become crucial. It is hoped to help solving problems in English acquisition in Indonesia. This is in line with Read’s statement that second language acquisition is essentially a matter of learning vocabulary (2000:1). It is supported by a linguist, David Wilkins, that “without vocabulary nothing can be conveyed” cited in Thornbury (2002:13). There are a lot of methods of teaching English in Indonesia have been applied and changed so many times from time to time, however, the result was still not delighted because the main problem is not merely on the teaching method but much more than that (Dardjowidjojo, 2003). In addition, according to Coady & Huckin (1997:230) mostly the problem of second or foreign language acquisition is the limited exposure of the target language in and out of the classroom. Learners do not have much time to negotiate their vocabulary in term of communication to the other therefore they will not be able to retain and add their vocabulary into their mind. In this condition where the circumstances do not make it possible to accelerate the acquisition of vocabulary, one way to help learners is by developing a systematic individual learning through giving training to learners so that they can be good and autonomous learners. By doing it, instead of turning into passive learners, they will become active learners. To be able to develop the systematic individual learning, learners should be equipped with learning strategies. This is relevant with the goal of learning strategy that enables learners to be independent (Hedge, 2000:76-77). Therefore learners can take more control on their own learning process and take more responsibility on their study. Furthermore, Nation (2001:222) states that a large amount of vocabulary can be acquired by the help of learning strategies (vocabulary learning strategies) and that strategies proved to be very useful for vocabulary learners coming from different levels. This is why equipping learners with vocabulary learning strategies hopefully will help them to become more skilful learners. Nevertheless, not all learning strategies components are employed in this research, rather, only three components seemed to be relevant with the condition, they are; cognitive, memory, and metacognitive strategy. To be more specific this research attempts to answer these three following questions: How is the process of classroom activities by empowering vocabulary learning strategies? What are the barriers of implementing vocabulary learning strategies in the classroom? Does vocabulary learning strategies’ training facilitate vocabulary mastery? The design used in this research is an action research. The aim of this action research is to control the variable that in fact, affects the result of the system or program process. In this action research, the writer implemented some actions. Action research is defined as any systematic inquiry conducted by teacher researcher, principal, school counselors, or other state holder in teaching/learning environment to gather information about the ways that their particular schools operate, how they teach, and how well their students learn (Mills, 2000:6). Data is collected from direct observation will be analyzed qualitatively and quantitatively then directed to answer the questions “How is the process of vocabulary classroom activity by empowering vocabulary learning strategies through computer mediated communication?”, data taken from the observation will be analyzed to answer the question “What are the barriers of implementing vocabulary learning strategies through computer mediated communication?”, the result of the test to determine whether vocabulary learning strategies enhancing vocabulary mastery or not will answer the question “Does vocabulary learning strategies training facilitate vocabulary mastery?”. The classroom activities in this study can be divided into two types, the training activities in the classroom which uses direct interaction as the first type and the training activities which uses internet as the second type. The classroom activities is conducted to train students directly with learning strategies as researcher consideration that conducting though the internet seems to be difficult to do, so that the researcher uses internet activities as a second type to give assignments and tasks to students and students have to submit it in the same way. Besides, by using the internet, it is also to be the media of communication between researcher and students if there are problems in doing the assignments and tasks. Based on the observation done by the observers, it can be concluded that students’ activity both through the classroom and internet are able to improve their ability in vocabulary mastery as well as to improve students’ ability in using the internet. These activities really attract students to be more active in doing the assignments and tasks. The classroom activities involved in the training of learning strategies are meant to achieve the use of various learning strategies in dealing with vocabulary. In the first activity which is listening or paying more attention to the researcher’s explanation, the result from the first to the last cycle is constant with the percentage of 100% which means that the students are very serious in their learning. For the second activity is understand the material well, the percentage in the first cycle is 100%. However, this figure decreases until 37%. Because of the complexity of the material which requires the students to use many kinds of strategies in their vocabulary learning. From the discussion it is found that mostly the obstacles faced by the students and researcher in this study are on the application of learning strategies in other contexts, it is revealed that this item only reaches 70% from the total percentage of 100%. It is considered the lowest percentage in the items of teacher and students’ activities. The skill of using the internet at first by the students is also considered to be the problem in accelerating the training process. The problem of students’ vocabulary mastery can be improved by employing learning strategies. It can be seen from the result test that the average score from the second cycle reaches 87%, third cycle 92% increases 5% from the previous cycle then, after students get a training of direct and indirect learning strategies, in fourth cycle reaches 96%, and the last cycle reaches 98%, 2% higher than the fourth cycle. From this finding it can be concluded that learning strategies can improve students’ ability in vocabulary mastery. The tests given to the student after finishing each cycle consists of 30 questions; 10 items of synonyms, 10 items for antonyms, and another 10 items for the application in the form of sentence building. The scores gathered from each cycle proved to have a significant improvement. In the second cycle the students’ average score is 26.23 which means that 87% of the students do the test successfully although they only use two strategies in completing the task. In the third cycle the students’ average score is 27.74 which means that 92% of the students do the test successfully. In this cycle the students still have difficulties in using -s/-es for the verb of singular subjects and also in using complete subjects, predicates, and objects in their sentences. In the fourth cycle the students’ average score is 28.71 which means that 96% of the students do the test correctly, while in the last cycle the average score is 29.07 which means that 98% of the students do the test correctly. It is merely because the students are able to write good sentences using complete subjects, predicates, and objects. Anderson, Lorin W. and Kratwohl, David R. 2001. Taxonomy for Learning, Teaching, and Assessing. A Revision of Bloom’s Taxonomy of Educational Objectives. New York: Addison Wesley Longman, Inc.
Brown, Douglas H. 2000. Principles of Language learning and Teaching. New York: Addison Wesley Longman, Inc.
Brown, H. Douglas 2001. Teaching by Principles, an interactive Approach to Language Pedagogy, Second Edition. New York: Addison Wesley Longman, Inc.
Chin, hsien-jen. 2001. “The Effects of Dictionary use on the Vocabulary learning Strategies Used by language learners of Spanish”. Paper presented at the annual meeting of Spanish and Portuguese as First and Second language, Spanish. Coady, James and Huckin, Thomas. 1997. Second Language Vocabulary Acquisition. United Kingdom: Cambridge University Press. Ellis, Rod. 1994. The Study of Second Language Acquisition. Oxford: Oxford University Press. Harmer, Jeremy. 2002. The Practice of English Language Teaching. Malaysia: Pearson Education Limited. Hatch, Evelyn and Cheryl Brown. 1995. Vocabulary, Semantics, and Language Education. New York: Cambridge University Press. Hedge, Tricia. 2000. Teaching and Learning in the Language Classroom. New York: Oxford University Press. Johnson, Keith. 2001. An Introduction to foreign Language Learning and Teaching. England: Pearson Education Limited 2001. Mc Niff, Jean. 1992. Action Research: Principles and Practice. Great Britain: Routledge, Chapman and Hall, Inc.
ation, I. S. P. 2001. Learning Vocabulary in Another Language. Cambridge: Cambridge University Press. O’Malley, J Michael & Anna Uhl Chamot. 1990. Learning Strategies in Second language Acquisition. Cambridge: Cambridge University Press. Oxford, R.L, 1990. Language learning Strategies: What every Teacher Should Know. New York: Newbury House. Rachmadie, Sabrony. 1999. Vocabulary. Jakarta: Universitas Terbuka, Depdikbud. Read, John. 2000. Assessing Vocabulary. Cambridge: Cambridge University Press. Richards, Jack C. and Lockhart, Charles. 2002. Reflective Teaching in second language Classroom. Cambridge: Cambridge University Press. Scharle, Agota and Szabo, Anita. 2000. Learner Autonomy: A Guide to Developing Learner responsibility. United Kingdom: Cambridge University Press. Schmitt, N. 1997. Vocabulary learning Strategies. In N. Schmitt & M.Mc Charty (Eds. ), Vocabulary: Description, acquisition, and pedagogy. Cambridge: Cambridge University Press. Scholfield, Phil. 1999. “Dictionary Use in Reception”. International Journal of Lexicography, Vol 12 No. 1 1999. pp 13-34. Shi Wu, Wei. 2005. “Use and Helpfulness Rankings of Vocabulary Learning Strateges Employed by EFL Learners in Taiwan”. Journal of Humanities and Social Sciences. 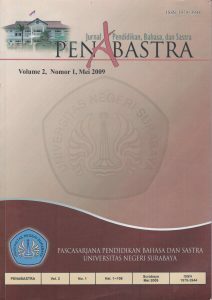 Vol.1, No.2, pp.7-13. Stringer, Ernie. 2004. Action Research in Education. New Jersey. Pearson Education, Inc.
Thomas, R Murray. 2003. Blending Qualitative & Quantitative Research Methods in Theses and Dissertations. California: Corwin Press, INC.
Thornburry, Scott. 2002. How to Teach Vocabulary. England: Pearson Education Limited.